Summary: A grandfather walks with his granddaughter, grandson, and their dog in an outdoor setting surrounded by activity and sound: flowers moving in the breeze, insects buzzing, birds flying frogs jumping, ducks swimming, and trees swaying. Then the animals, birds and insects grow quiet. “Let’s not be so busy,” says Grandfather and the three sit on a bench with the dog at their feet. “”Let’s just be quiet.” “I can think when I’m quiet,” says the girl. “I can see when I’m still,” says the boy. To be quiet and still is a special thing. Literary elements at work in the story: dePaola has written a quiet book: soft colors, uncrowded pages, expanses of white. Only the first page of text conveys the busyness of the world in which they walk. There is little text and a single message. 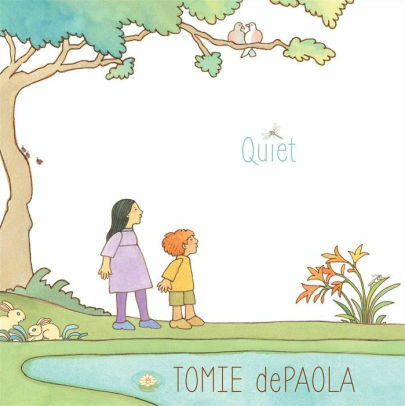 Tomie dePaola has written over 200 children’s books and won, among many, both Newbury and Caldecott honor awards . His books, translated into 15 languages, have sold over 5 million copies. Obviously, his work speaks to children but those who are already acquainted with him may find this a rather “thin” book, missing plot and action so prevalent in most of his work. It would be possible to plan an elementary church school curriculum around his Bible stories and lives of saints. Finding quiet in a park or country setting is more likely than finding it in the urban areas where more children live, engaged by traffic, sirens, and crowds as well as videos, games, and telephones, so the book may fall short in another area: connecting with urban children who need to be quiet. Theological Conversation Partners: A cartoon pictures Peter welcoming a new comer with a cell phone in his hand at the gates of Heaven. “You had a very interesting life,” says Peter, “but you missed it.” Mindfulness is a current and necessary theme in works on meditation and spirituality. Essentially it means paying attention to where you are both mentally and physically. Though the focus is not necessarily the same, this is primary in Christian prayer and meditation as well. Our world is busy with sights, sounds, entertainment, and experiences. TV and computer games and extracurricular activities consume many of a child’s hours. We are all apt to miss life. To be quiet, to be aware of our thoughts,to look carefully at the world around us-these are ingredients in a growing life with God. In Psalm 46:10 God calls us to be still and know. In Matthew 6:26 Jesus invites us to look at the birds of the air and consider the lilies of the field. The parables Jesus told show how carefully he paid attention to his world. With young children, learning to be still with God may be as simple as a quiet moment before the table blessing, calling attention to a beautiful sunset, sitting quietly and watching a bird. As children grow older the silence can be more intentional. And blessed is the child who can sit alone for thirty minutes quietly. Quiet can help set the stage for this. One significant aspect of this book is that the quiet is shared. Where are the grandfather and his grandchildren? Suppose they had been walking downtown or to a store. What would they have seen and heard? Could they have been quiet then? What was the girl thinking when she was quiet? Where and when are places that you can be quiet? Part of our worship service is quiet. What are we doing? Does being quiet mean just not talking? Is there a difference in being quiet alone and sharing silence with others? Thanks to regular contributor and alumna Virginia Thomas for writing this book review. Quiet by Storypath is licensed under a Creative Commons Attribution-NonCommercial 4.0 International License.